Online gambling in the United States is a mine field, to put its complicated nature lightly. For the past six years legislation for Internet casinos and betting sites have been enacted and handled on a state-by-state basis, resulting in varying laws and a ton of confusion among both local and international communities. This article will be a handy resource for readers seeking answers about the current states in America which have legalised online casinos and several more aiming to so in 2018 and beyond. The United States handles online gambling laws very different compared to many other countries due to the way its many states and their local governments sort out their own gambling-related licensing and regulation laws, but there is still one key piece of legislation: The Unlawful Internet Gaming Enforcement Act (UIGEA) of 2006. This act changed everything about how online casinos in America and how US-based residents were allowed to gamble on the Web; essentially, as an update of the outdated Wire Act of 1971 (which did not, at the time, cover modern-day platforms like the World Wide Web) the UIGEA banned American banks processing payments related to online gambling. The UIGEA notably did not target individual online players, or outlaw the practice in general; it just aimed to dismantle it by dissuading America’s financial institutions from dealing with online gambling by making it illegal. It evidently worked, as big names like Party Poker left the US market after paying off million-dollar fines to avoid prosecution, deeming it a cheaper way to go forward. Other online gambling sites like Full Tilt and PokerStars which were based and licensed outside of the USA continued on for a time before the toll of the government’s strict new laws on its banks and credit card providers proved too costly. By April 15 2011 (referred to as ‘Black Friday’ by many gamblers) the majority of online casino, poker and sportsbook operators ceased offering their interactive gaming services to United States players due to the very strict laws enacted, as they did not want to be fined or blacklisted for not complying. Those few casino websites that continued to service Americans after the UIGEA was enacted either set up shop and got licensed in offshore advanced gaming jurisdictions or operated in less-than-trustworthy circumstances (i.e. went unlicensed). Since then, the complex and controversial topic of online gambling and its continuing evolution – including the use of digital cryptocurrencies such as Bitcoin and Litecoin as betting money, and alternative payment services like e-Wallets and prepaid cards – has also been handled by each individual state. From 2013 to 2017, three states in America have officially made online-related gambling legal in their own way: Delaware, Nevada and New Jersey, the last of which currently and clearly leads the charge with a booming locally-regulated iGaming industry. Which American states is online gambling already legal in 2017? New Jersey: Since November 2013, online gambling – including betting sites, poker rooms and casino sites – have been officially legal in the state of New Jersey. As the third state to legalise the operation of iGaming online casinos in its jurisdiction which are run by Atlantic City land-based casino businesses, it has experienced the most success since regulating Internet wagering. A mid-2017 white paper sponsored by American gambling advocacy group iDevelopment and Economic Association (iDEA) revealed the state made more than $998.3 million in revenue and created over 3,374 new jobs and $218.9 million in wages since legalising online casinos.If you live in New Jersey, you can gamble online freely at one of the many NJ government authorised iGaming casino sites. Delaware: Since 2012, online gambling (casinos, racing and sports betting) has been legal in the state of Delaware. As the first state to legalise iGaming online casinos in its jurisdiction, Delaware citizens have been able to play at state-regulated online casinos without fear of prosecution – they just have to play at said online casinos within the state. Delware’s three horse racetracks – Dover Downs, Delaware Park, and Harrington Raceway – operate the state licensed and regulated iGaming casino sites, and collectively earned over $3 million in net revenue in 2016, itself a 62 per cent bump from the previous year. Being a smaller state it has generated significantly less than New Jersey but is still a model example of how well online gambling can be handled (and what it can offer to the state) should other states pick up the mantle and legalise and regulate casino sites effectively. Nevada: Since February 2013, online gambling (casinos, racing and sports betting) has been legal in the state of Nevada. It was the second state to legalise iGaming online casinos in its jurisdictions, run by all the main land-based casino venues in the state to offer only to Nevada residents. However, the Nevada Gaming Control Board only permits the play of online poker at its iGaming regulated casino websites, with its sites pooling Delaware and Nevada’s million online poker players together. Illinois: With several local politicians and groups successfully passing a bill to discuss state sponsored online games legislation and approve legalisation and regulation of online casinos, poker and daily fantasy sports sites, Illinois’s online gambling future looks set to follow in the footsteps of the preexisting trailblazers. The new bill also looks to establish an autbomous Division of Internet Gaming to run the state’s proposed iGaming industry; unfortunately, House Bill 479 is currently locked in the Illinois State House following a budget crisis for the 2018 fiscal year and a lack of discussion on the floor despite multiple hearings. We can only hope things will become clearer and move forward for the state soon. Industry analysts predict over $266 million could be generated for Illinois in five years should the state legalise online poker and casino gambling. Pennsylvania: Pennsylvania looks to be the next state to follow in the foot-steps of New Jersey and pass a bill to legalise and regulation gambling. In May 2017, the Senate passed said bill (H 271) with a majority vote of 38-12, and now it needs to move through the House of Representatives to be enacted officially. The provisions in the bill include legalising online casinos, online lottery games and daily fantasy sports, among other things, but a potential setback compared to other states is the bill still contains high taxes and fees for potential iGaming casinos and operators. Online casino gaming revenue would be taxed at a rate of 54 per cent, the same as land-based slot machines in Pennsylvania. 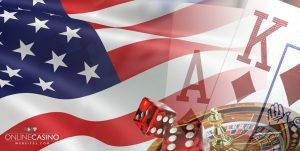 Online poker would still be taxed at 16 percent, but unfortunately the latest amendments on the Senate floor did not include any other changes to these stipulations – which could discourage land-based venues from opening iGaming sites. In October, the Senate bill with amendments, including the addition of video slot terminals at truck stops, passed both houses. The bill, which favours casino operators, allowing them to apply for a license and provide online gambling games and poker in Pennsylvania, is now waiting to be signed into law by Governor Tom Wolf. What about offshore-based online casinos for USA players? US residents playing at online casinos based offshore continues to be a complicated topic. American online gambling laws target the operator, not the player, so many US players play at foreign online casinos without prosecution or any legal issues even though they shouldn’t be. Our advice is if you are new to the online casino scene and live in a state where iGaming is legal and regulated, opt for your local choices for peace-of-mind and ease of access. If you are more experienced with offshore based Internet casinos, we recommend reading up on our reviews of the top recommended sites for USA real money players, which are all licensed and regulated by trustworthy advanced gaming jurisdictions like the Malta Gaming Authority and United Kingdom Gambling Commission.